Exclusive Timbits Poutine & Pretzel Donut Sandwich at the CNE. This past weekend I had the opportunity to visit the Canadian National Exhibition (CNE) which runs from August 21st until Sept 7th. It's an annual event that takes place at Exhibition Place, in Toronto. This event conjures up mixed feelings for me and I can guess for most people as well. It signifies that the end of summer is near. It's a tradition that my extended family and I have built over the years. We've bonded over the the many food concoctions offer every year and it's just a great way to have fun for both adults and the kids! The CNE consist of rides, food and entertainment for all ages. There are enough activities to last you the day, at the CNE. One of my favourite things to do is to visit the Food Building. 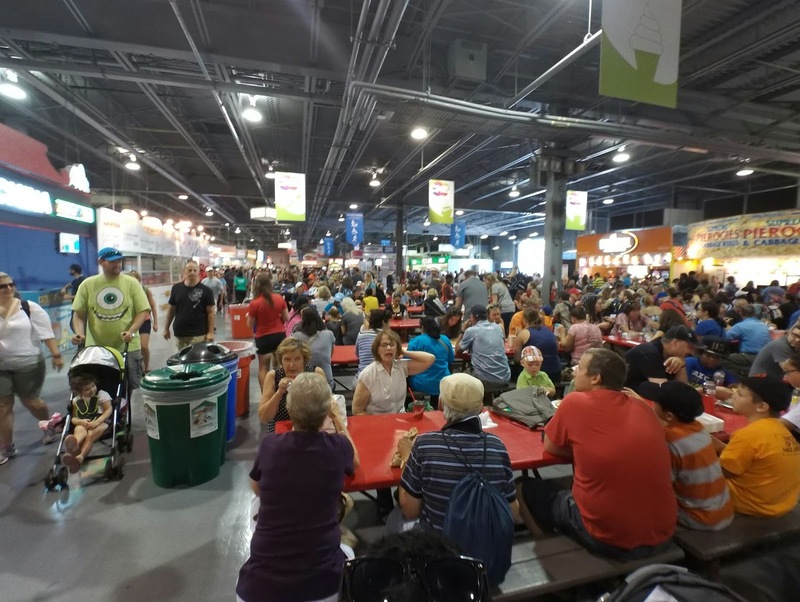 The Food Building is one of the popular attractions at the CNE every year and listed on my itinerary...as usual the first stop! The CNE has been know for their crazy food or shall I say "food combinations." They have had deep fried butter balls, crispy chocolate chicken and much more extreme food selections. Large crowds at the Canadian Nationa Exhibition- Inside the Food Building. Thanks to the folks at @MyTimHortons I was able to experience the exclusive options only available inside the Food Building at Tim Hortons. This year @MyTimHortons has introduced the Timbits Poutine & Honey Dijon Ham Pretzel Sandwich. The Tim Hortons at CNE has also introduced the exclusive items below. The particular flavouring that had my tastebuds dancing was the Pretzel Donut from @MyTimhortons. If you're someone that likes salty and sweet at the same time, this menu item is for you. The Honey Dijon Ham pretzel donut sandwich consists of ham, pepper jack cheese & red onions with Dijon mustard. It's actually made with a real donut and not a bagel. It's a sweet & savoury softness with a pretzel texture. The Timbits poutine and Pretzel Donut sandwich is only available inside the Food Building for a limited time. 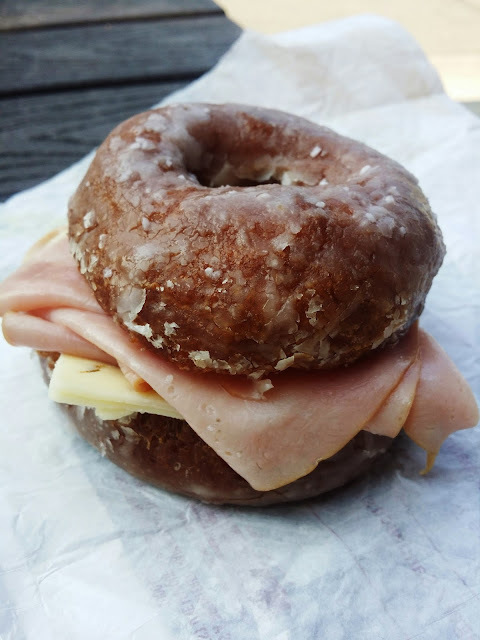 Honey Dijon Ham Pretzel Donut Sandwich- Available only at CNE for a limited time. In partnership with @MyTimHortons I'll be giving away a pair of CNE passes for you to WIN so you can try the exclusive menu items. "@clickflickca I want to WIN passes to the @letsgototheex & try the #PretzelDonut at @MyTimHortons #CNE2015"
Visit the Tim Hortons locations closes to the CNE at 171 East Liberty St which is OPEN 24hrs. Exclusive menu items #Timbitspoutine & #pretzeldonut are only at CNE. Find your drive & love it with Schick. What drives you...literally? Driving is a big responsibility yet it opens up a multitude of opportunities. What do I mean? I am a person that lives in the city and craves the amenities of the local shops & different neighbourhoods. My modes of transportation include walking or taking the local transit system to get to various points of interest within the city. It continues to be a fun and enjoyable commute for a city dweller. On the other-hand, driving a car is a game changer, let me explain. There are so many benefits to driving. The main benefit is being able to visit different places beyond your local area of your choosing. Living downtown you get a little accustomed to seeing the same things over and over. It becomes repetitive...sometimes too routine. Being able to drive and explore different places becomes exhilarating and liberating. You get to venture out and discover unknown territory... in places you never knew existed. It frees you to explore different cultures and ways of living. You begin to realize where Toronto derives being called a multicultural city. It's like having the whole world within a city. Dabbling outside of your comfort zone now and then is also amazing for the soul. It opens your mind to endless opportunities. 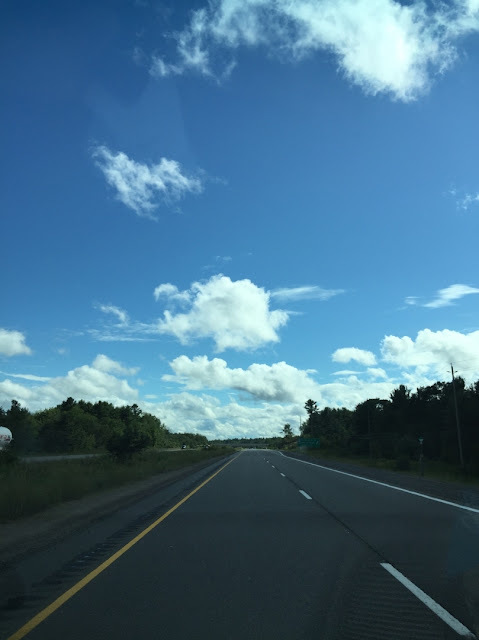 I encourage you to drive somewhere that you have never been before and experience the thrill of where life takes you. It could be another city, a few hours drive away, or just being able to bask in one of nature's beautiful scenic routes... apart from your usual local sights and sceneries. Be creative. Be spontaneous. Don't own a car or vehicle? No problem. Today there are many options to getting around such as a car sharing companies, services, and car-pooling to name a few. Do not limit yourself. Try a new adventure... go out...explore!! Find your "drive"... you'll love it!! Thanks to the folks at Schick they can help kick-gear your future adventure with this contest! Enter this cool contest! The Schick Drive Free Contest. 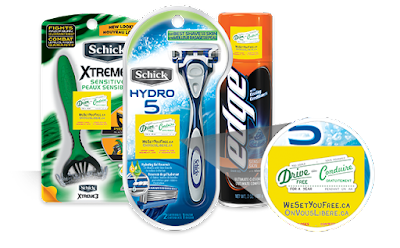 Purchase any specially marked Schick product ( look for a yellow Drive Free for a Year sticker ) & register for the contest online or on your smartphone at www.wesetyoufree.ca. Two ways to enter. Schick will also be doing weekly giveaways from Twitter @freeyourskinCA throughout the duration of the contest until September 2015. 1- With purchase. Once you've registered, enter your unique PIN code. You could WIN instantly! Also every entry automatically enters you for a chance to Drive Free for a Year. Look for the specially marked Schick products with Yellow Drive Free for a Year sticker. 2 - Without a purchase: Write a 50 word essay on "Why Schick" is your favourite brand and mail it to: Schick Drive Free for a Year Grand Prize Draw & Instant Win Promotion (Request for No Purchase unique PIN number), Dept 3112, Box 9500 Lakeshore West PO, Oakville ON L6K 0G4. You'll receive a unique code and you could visit www.wesetyoufree.ca for your chance to WIN instantly! Over 2,450 instant prizes that include GPS systems, pre-paid gas cards and sunglasses! The Grand Prize winner will have Schick pay your gas, insurance & depreciation for a year! Good Luck everyone! Disclaimer: This post was created in partnership with Schick and I received compensation for this post. Summer Nights at Mohawk Racetrack. 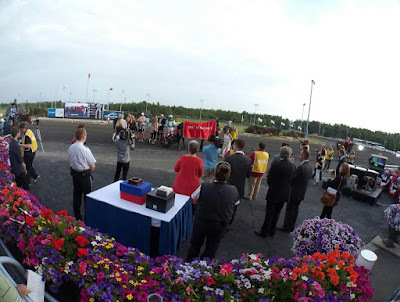 My first visit to Mohawk Racetrack was to participate in the Pepsi North American Cup event. I did not know what to expect on my first visit to Mohawk. 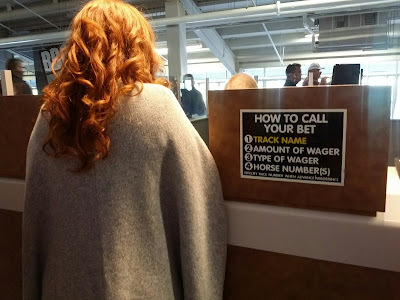 I was in awe of all the sights and sounds that I never even had the chance to place a bet on any of the races taking place that day. Prior to my 2nd visit to Mohawk, I began to do some online research and visited the Mohawk website to learn more about the horse racing. I used the website & friends to get some simple tips on how to place a bet. I simply began placing bets based on how a name appealed to me. It's not what an experienced person would do but I was hoping beginners luck would kick in and it was simple! I placed the minimum "basic" bet of $2 for a horse just to "WIN" the race. That means the horse has to finish first. I progressed to another $2 bet for a horse to "PLACE" which means the horse must finish first or second. 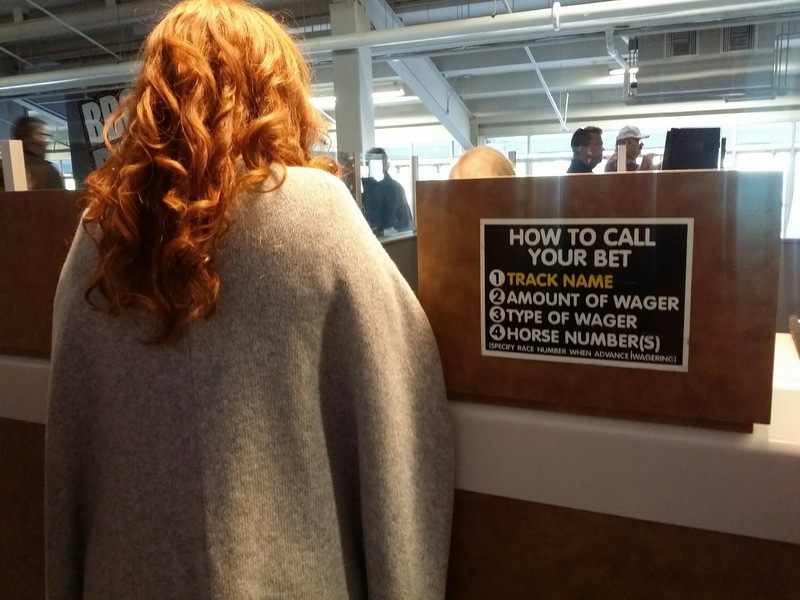 How to call your bet at the teller. On the night that I visited Mohawk there were 12 races taking place that day. I made basic bets throughout the first few races by going to the teller/kiosk and placing my bets. My friend Graham who knew much more than me on betting horses recommended I place more "fancier" bets. I'm sure you've heard Exactor and Triactor and Pick 4 terms before-I was still learning all these types of bets. I decided to "fancy up" with an Exactor Box Bet. Exactor is a bet in which the two horses I pick finish in exact order of 1st and 2nd place. Boxing this bet allows me not to worry about the order the horses place. The 2 horses don't have to WIN in exact order so long as they still place first or second. This gives more flexibility to your bet. I personally think this is the best way to start and progress. Once you get the hang of it you can expand your betting style to include Triactor and Pick 4. These are some of the bets I will learn to do on my next visit to Mohawk for Metro Pace on Sunday September 5th. Mohawk had given me an HPI Card which you can reload with any amount/value you like. 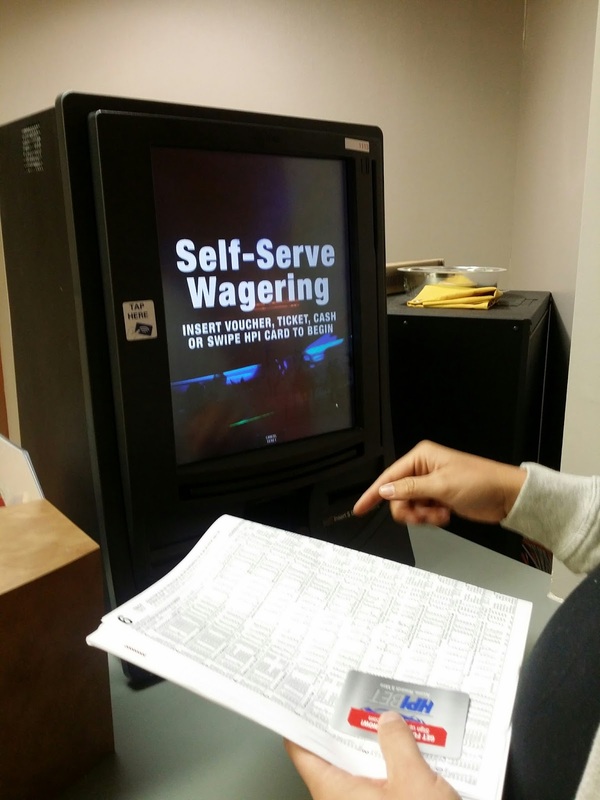 This card system allows you to place bets via a Self -Serve Wagering touchscreen kiosk located throughout Mohawk Racetrack. It also allows you to place bets at other tracks around the world. I am told you can also place bets from your smartphone if you install the mobile App. The kiosk is quick and lines are usually shorter than the regular teller. On first try it takes a little getting use to but very simple once you place a couple of bets. 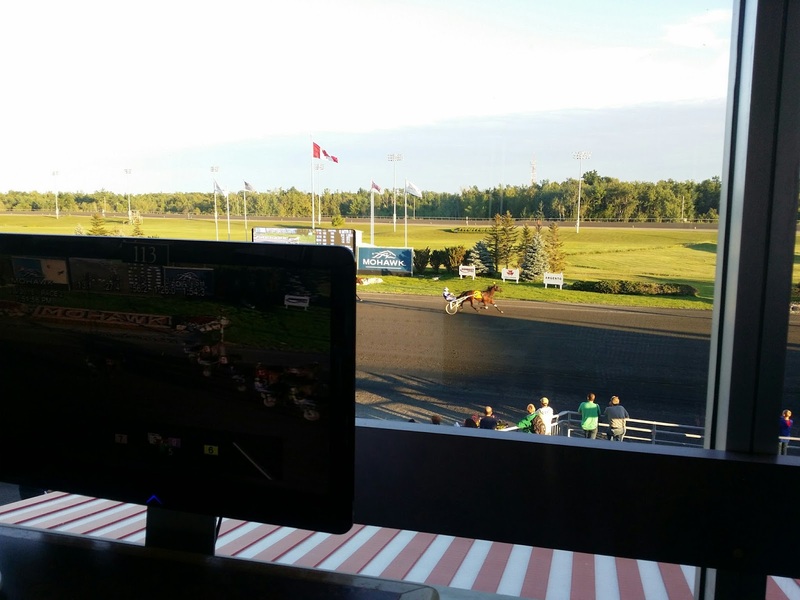 22" inch televisions at each table in the Terrace Dining Room at Mohawk Racetrack. One of the nice features of Mohawk Racetrack is the Terrace Dining Room. This area overlooks the track and you can enjoy dining and betting with 22" tv monitors at each table. On Fridays they have All You Can Eat Italian Buffet. Yummy! Saturday Buffet spread at the Terrace Dining Room. The Mohawk Racetrack is open 5 days a week. Parking and admission are always free. Mohawk also has a daily food and drink offer. Monday- Half Price Wings & Pint offer. Tuesday- Burger and Brew offer. Thursday- Steak and Stella beer. Friday- All You Can Eat Italian Buffet where Kids Eat Free. Saturday- Live music on the Corona Patio Deck. If you're looking to do something new and different with a bunch of friends, I highly recommend visiting Mohawk Racetrack for a fun day of excitement! When you visit Mohawk Racetrack this summer, make sure to enter the selfie contest to WIN $1,000. Contest info below. Disclosure: This post was created in partnership with Mohawk Racetrack, however, all opinions expressed are 100% my own. 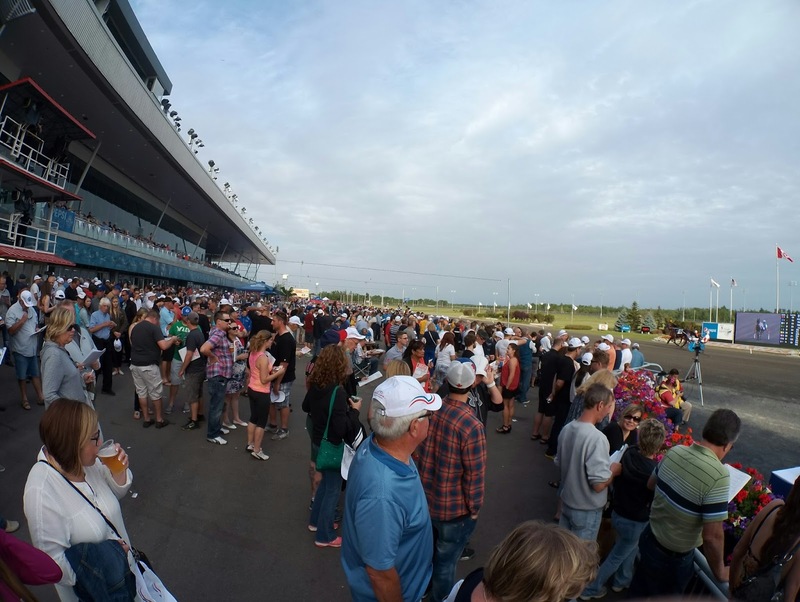 Large crowd at Pepsi Cup - Mohawk Racetrack. I'm excited to partner with Mohawk and I'm off to the races tomorrow! 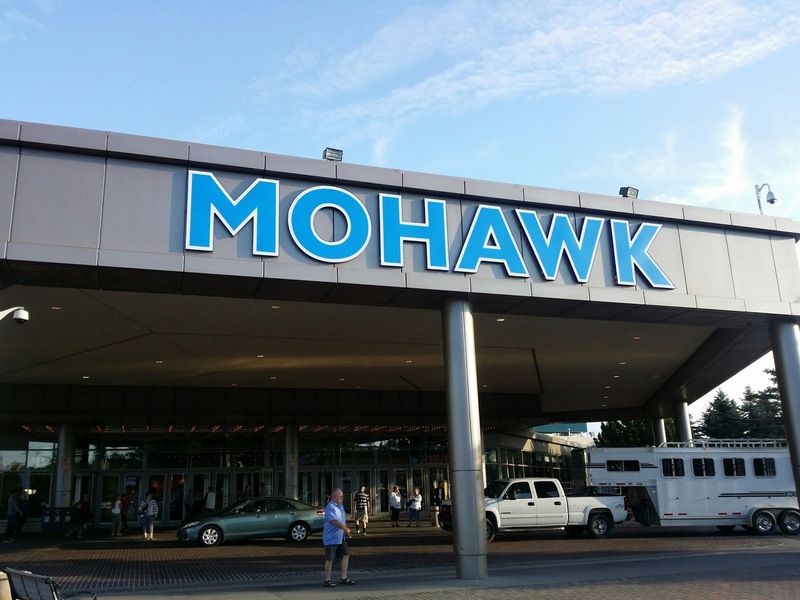 I will be attending Mohawk's Summer Nights to experience an evening of fun and excitement. 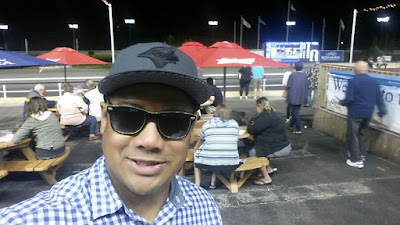 A few weeks ago I attended Mohawk Racetrack for the first time and I really had a great time experiencing the sights & sounds at the track. This weekend I'm excited to do it all over again and explore Mohawk RaceTrack. 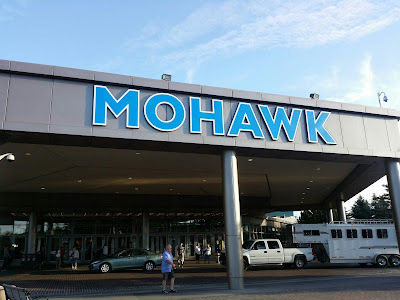 I'm excited to place some bets and check out the amenities and services available at Mohawk. 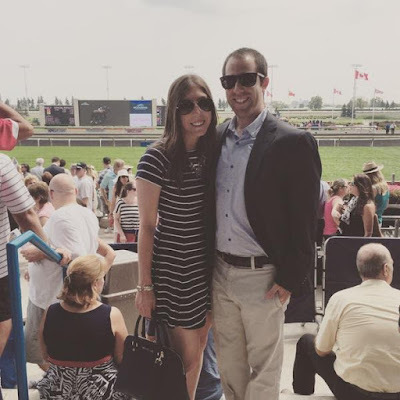 I'm new to the world of horse racing but I'm excited to share my experience and I hope you can learn and enjoy horse racing with me during my experience. Winner's Circle at Mohawk Race Track. Throughout this years racing season at Mohawk & Woodbine, you could WIN a $1,000 Mohawk racetrack Gift Card. 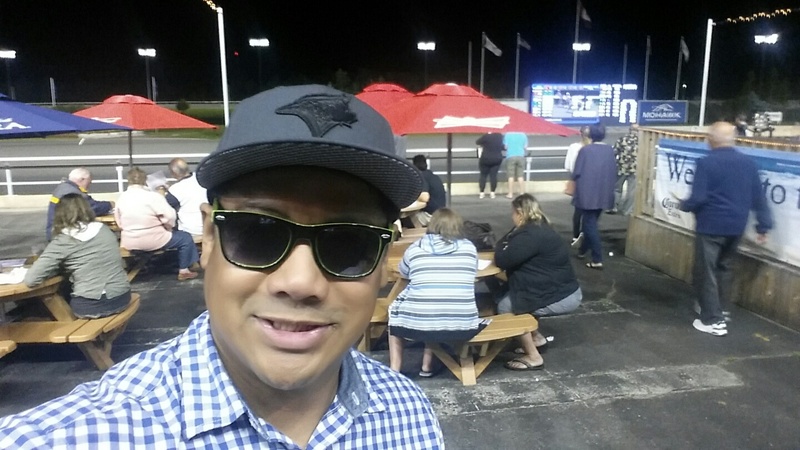 Snap a selfie at the Mohawk racetrack and post to Twitter using the hashtag #OffToTheRaces These selfies must be taken in front of the racetrack. This automatically enters you in the contest. Good Luck! Follow me this Saturday August 8th, 2015 from 7pm-11pm on Periscope, Twitter & Snapchat. 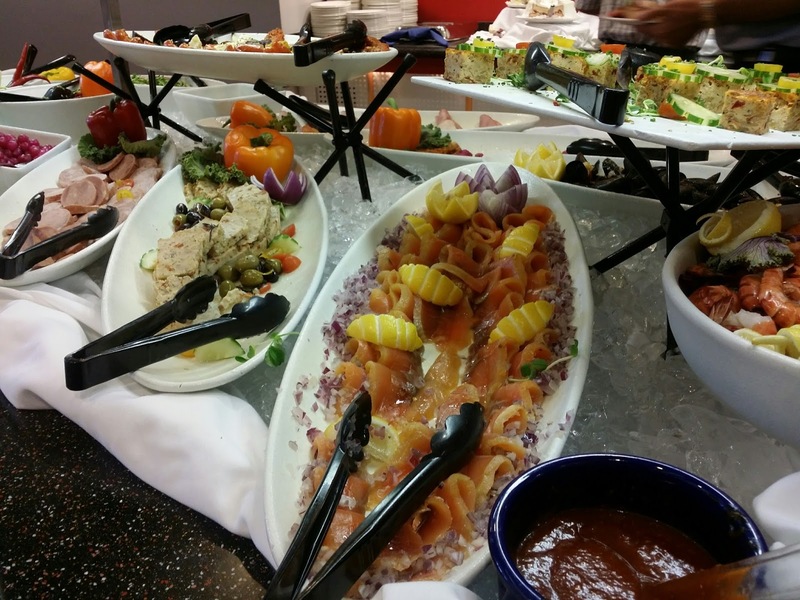 I hope to give you a behind the scenes experience, including the food and my betting experience! This is going to build up to the Metro Pace event on Sunday September 5th & feel free to join me.